At the start of the ascetic path to Mt Omine, Shugendo practitioners have gathered at this temple for prayer and meditation since its founding around 645. The temple name translates as “Dragon Spring Temple” and there are many dragon and snake motifs around the complex along with a sacred pond and a sacred waterfall. The main hall is guarded by a striking pair of male and female demon figures. Some features are only available to men, such as the experience of standing in prayer under the waterfall and the Shukubo overnight lodgings. The temple has a legend that a local man met a woman here and they lived together and had a child. One day, he came home early and discovered she was actually a giant white snake. Entrusting him to care for the child, she retreated to the temple pond, asking him to ring a bell three times every morning and six times at night to help her pass the days. That temple bell is still rung every day. High above Dorogawa town, this dome-shaped limestone cave complex has stalactites and stalagmites, illuminated by coloured lights. The path is a little slippery and has low overhangs, so the rental helmets are recommended. Access is by a quirky monorail train, shaped like a wooden log. The observatory near the cave entrance has sweeping views and a rest area with hot and cold drinks and toilets. This museum provides information about folklore and other subjects. Visitors also can experience copying the sutra (1000 yen). This large suspension bridge spanning between Mt. Ryusenji and Mt. 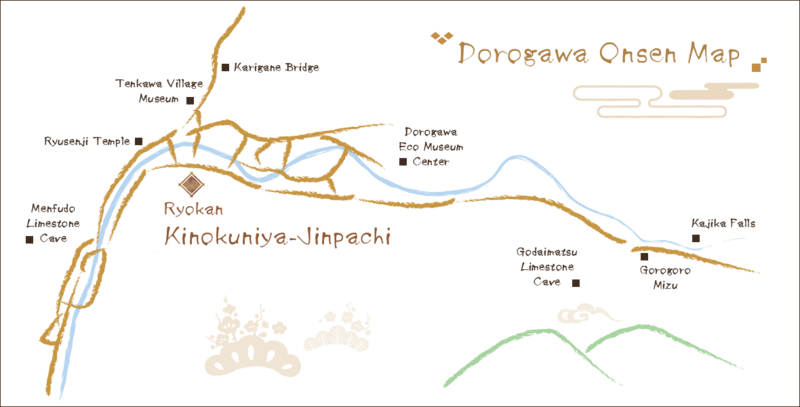 Ohara on the Dorogawa Nature Trail is 120 m long and 50 m high. It offers a panoramic view of Dorogawa Onsen Hot Spring. In this hands-on museum at the foot of the Omine Mountains, you can see, touch, and get closer to the wealth of nature and culture of these mountains, based on the themes of nature, water, and mountaineering asceticism. It also offers a wealth of nature tours (for a fee) year-round, for an enjoyable time spent hiking, identifying natural plants, or birdwatching. The view here has been designated a prefectural natural monument. A tram takes visitors on an adventure into the cave, more than 200 m underground! Walking along Dorogawa’s main street, you see gourd-shaped pet bottles tied to some of the wooden houses. Townsfolk use these pet bottles to collect Gorogoro Mizu spring water from the local spring. Set in a cedar forest, the free spring is a popular tourist spot. These waterfalls are named after the kajika frogs who live in the clear stream and sing beautiful songs. Founded around 700, this shrine is associated with Benzaiten, the deity of art, music and water and combines many elements of both Shinto and Buddhism. The temple is popular with Shugendo practitioners. This shrine has a Noh stage, and performances are usually held in July. It is also considered to be a “power spot” by many new age enthusiasts. The climb to the shrine involves several steep flights of stairs through a forest of cedar and oak trees. In Totsukawa Village, located at the southernmost tip of Nara Prefecture, you can enjoy a stroll through the sky on the Tanize suspension bridge and experience the vastness of nature, including Sasa Waterfall, named one of the 100 most beautiful falls in Japan. Alongside Naramachi and Nishinokyo, Nara Park is one of the must-see areas in Nara City. The vast area covers 660 hectares and is renowned for its free-roaming deer and world famous temples. One of Japan’s most famous tourist destinations, Kyoto offers famous sightseeing spots such as Kiyomizudera, Kinkakuji, and Ginkakuji temples as well as opportunities to see geisha in Gion and a wide range of other experiences. The main city in the Kansai region, Osaka offers a wealth of gourmet dining and sightseeing opportunities. Here you can savor the delicious tastes of Osaka in Dotonbori, Shinsaibashi, and Shinsekai along with various entertainment spots, including Universal Studios Japan©. This famous shrine is the oldest one in Japan dedicated to the god of the water. It’s also said to be the place where ema, votive wooden tablets painted with pictures of horses, got their start. A large area in southern Nara, Yoshino is best known for the mountain there of the same name. It is also renowned as a spring destination when over 30,000 cherry trees color the mountain and surrounding area pink. The best places to see cherry blossoms and bright autumn leaves are from Yoshimizu-jinja Shrine and Hanayagura Observatory, which offer sweeping vistas. Famous as a world heritage site, Koyasan is a place where you can visit numerous temples, including Kongobuji, the head temple of the Koyasan Shingon Sect, with wide-open views of the sky and the sea. One of Japan’s oldest Shinto shrines, Omiwa Shrine is dedicated to Mt. Miwa. Believed to be a protector deity for all aspects of human living, the mountain is known as a powerful, mystical spot. On the grounds of the shrine is a pair of rocks related to the legend of the “red string of fate,” said to help couples come together.